We wrote it. Did you buy it? 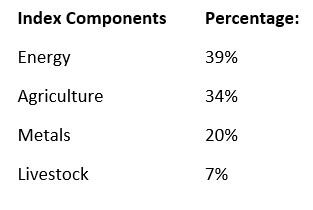 This year should see those commodities (and others) soar. The reason is simple … commodity prices are too low right now. If you are a fund looking for a solid return on your investment, those numbers are attractive. They will attract investment, which will drive the price higher. It’s made up of 19 fundamental commodities. As you can see, since January 1, 2018, the CRB rose 5% this year. And it’s poised to go up much more. When we look at the makeup of the index, we see several areas of rising prices. Energy prices are up substantially since January. Corn prices are up 15% this year. Wheat prices are up more than 23% this year. Those trends drove the commodity index higher. The metal complex, surprisingly, lagged so far in 2018. The copper price is down over 7% this year. The price of gold is flat for the year. The silver price fell 7% so far this year. I expect that trend to reverse shortly. All the metals’ prices should finish the year much higher than they are today. So far, 2018 lived up to our expectations through the first five months. However, it should perform even better through the rest of the year. This is just the beginning. The reason is simple … commodity prices remain too low. Metals like copper and zinc are in high demand. The oil market got much tighter. And agricultural stocks are soaring. If you want a solid return on your money with lower risk than a mining or oil company, a general commodity fund is perfect. The straightforward way for us to play that trend is to buy an exchange-traded fund (ETF) like the PowerShares DB Commodity Index Tracking ETF (NYSE: DBC) or the iShares S&P GSCI Commodity-Indexed Trust ETF (NYSE: GSG). These funds track commodity prices to give us exposure to the whole sector. Next »What’s Going on With Italy! ?